Custom Industrial Solutions | MARLEX Engineering Inc.
MARLEX Engineering is a provider of custom industrial solutions. Drawing from a broad base of knowledge and experience we have the flexibility to support customers in a range of different industries. We work with our customers to fully understand their particular needs before proposing options. We design and install solutions that address problems and make improvements to both new or existing workplaces and operations. Our unique solutions are tailored to the specific needs of our client’s industry and facility. We incorporate both off-the-shelf and custom-made hardware and software which we are able to integrate with equipment and infrastructure that is already in place. Where there is a need for a device to fulfill a unique or very specific purpose we can design and build a custom system to do the job. We can be called upon to assist companies by designing, prototyping and testing products intended for commercial sale. We also do the research and development work to progress an idea from the whiteboard to a working proof-of-concept. 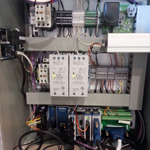 An industrial embedded controller is sometimes the best choice for running the software that controls the operation of a system. 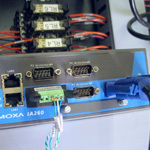 Our designs have been based on a variety of different embedded industrial controller platforms, among them Moxa embedded computers, Kontron embedded FLEX-ATX motherboards running a Windows® Embedded OS, and Beckhoff and Allen-Bradley PLCs. Systems for controlling and tracking worker access to hazardous areas (read more). 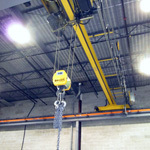 A Positioning System Retrofit for an Overhead Track-Mounted Crane. A SCADA for a wind farm sourced flywheel energy storage system. 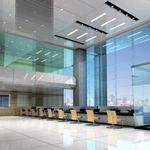 Building Automation Systems to manage HVAC and liquid cooling requirements. 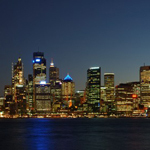 The Digitally Addressable Lighting Interface (DALI) defines a popular digital interface that is in use globally across the lighting industry for intelligent lighting management. 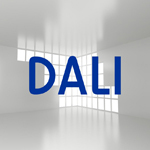 The DALI protocol is set out in the technical standard IEC 62386. We have a great deal of experience using the DALI interface and protocol and have assisted our clients in developing a variety of products that communicate over a DALI bus. Our experience includes both DALI control devices and DALI control gear, including control gear that is compliant to the recent DALI 2.0 standard. Dimmable electronic ballasts for fluorescent tubes. Converter for DALI control of existing lighting devices that require a DC voltage for a control signal. Keypad and Slider controls for setting and adjusting lighting levels. Room occupancy sensor using PIR motion detection. Room temperature and illumination level sensors. An example of custom solution to meet the needs of a client is the Automated Magnetic Field Intensity Mapping System. This system was designed to measure and record the magnetic flux density in a plane above a large circular magnet. 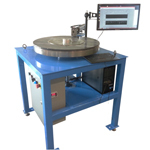 The resulting profile of the magnetic field above the surface of the magnet can then be used for Quality Control and verification purposes. The system rotates a platter on which the magnet under test has been placed while at the same time a measurement probe records the flux density at points above the magnet. Details of the testing procedure can be adjusted through user-configurable parameters. 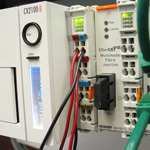 HMI through which settings can be configured, and progress and results displayed. Probe to measure flux density at a point. Motor driven platter to rotate the magnet under the measurement probe during the measurement process. Computer with Windows® OS to run the software and collect measured data. The MARLEX team has proven expertise in the design of both dimmable and fixed-output Electronic Ballasts for use in standard lighting applications as well as specialty applications such as Ultraviolet Light and Ozone sterilization and treatment for water and air. In an ongoing effort to reduce our carbon footprint on the environment, MARLEX Engineering Inc. has developed a series of dimmable electronic ballasts for use in building occupancy management and daylight harvesting applications. Our designs incorporate industry standard control interface methods for communication with the ballasts such as the Digitally Addressable Lighting Interface (DALI) and control by 0-10V DC voltage. 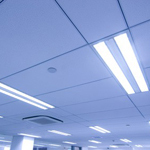 The light output of the fluorescent tubes can be adjusted by instructing the ballast to raise or lower the brightness to meet immediate illumination requirements around a specific light fixture. Energy savings can be realized by reducing the light output when full brightness is not required. Our ballast designs provide ultra low total harmonic distortion, stable light output and near unity power factor operation. The MARLEX design team has developed the components for a variety of Ultraviolet (UV) Sterilization systems, including intelligent electronic ballasts, ancillary sensors and Human-Machine interfaces for use with Standard Output, High Output, and Amalgam type Ultraviolet Lamps. Our designers were instrumental in the development, certification, and production setup of the commercially successful Platinum™ and ICE™ ballasts systems. We are currently designing new “SMART” ballast technologies targeted at the reliable generation of UV light and Ozone for both water and air sterilization applications. We have also designed electronic ballasts to drive ozone generating lamps for the Swimming Pool and Spa treatment industry. Ozone can also be used to destroy mold spores, bacteria, and other airborne pathogens in air conditioning and ventilation systems.